An Amtryke Evaluation Site is a therapy facility (hospital, clinic, etc.) 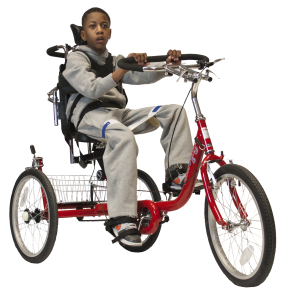 or school which receives Amtryke adaptive tricycles and accessories through donations by AMBUCS chapters or the national organization. The Evaluation Site agrees to use the donated equipment with their clients during therapy and to also identify and evaluate other riders for their own Amtryke. They may or may not be able to waive the normal office visit co-pay or charge. Contact the site for full details. The Evaluation Site program was created to provide places where people can be evaluated for an Amtryke by knowledgeable licensed therapists. This ensures the placement of equipment is both appropriate and correctly fitted. Click on the Advanced Search link close to the top to search by site name, city, state, zip or sponsor chapter. If there isn’t an Evaluation Site near you, don’t worry. Therapists who are not familiar with the Amtryke perform successful Evaluations every day. It is very similar to a wheelchair fitting. Visit here for more info about how to fit a rider to an Amtryke. Interested in becoming an Evaluation site? Contact your local chapter to see if they are looking for an Evaluation partner. Unless your facility is willing to actively fundraise for trykes as well as evaluate riders, a sponsoring chapter is required to start an Evaluation site. 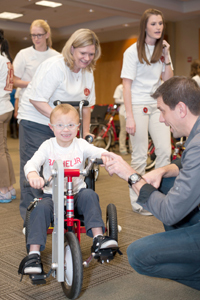 View our Evaluation Site Guide for Chapters and Facilities.